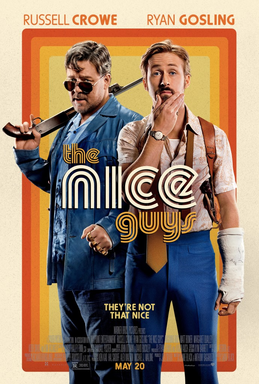 The Nice Guys is the latest film directed by Shane Black it’s also written by Black and Anthony Bagarozzi. It’s a neo-noir mystery, but also a buddy cop comedy film, leave it to Shane Black to meld these genres together. It stars Russell Crowe, Ryan Gosling, Angourie Rice, matt Bomer, Margaret Qualley, Keith David, and Kim Basinger. It’s about missing girl case that turns into something bigger, it just so happens that a private detective (Gosling) and a muscle for hire (Crowe) stumble upon these nefarious doings. The good; the writing is amazing. Black and Bagarozzi inject humor into a seemingly by the numbers noir mystery. It’s a story that we all know set in the 1970s and yet it’s new and refreshing all at the same time. The performances by Crowe and Gosling only intensify this. Speaking of performances, Holly March is the daughter of private eye Holland March, much like other Shane Black movies there’s a little girl involved, but this time Holly is just as essential to furthering the plot as the two leads. Job well done. Everything in this film gels, from the opening titles, to the aforementioned writing and acting, the look of 70s Los Angeles, and all the way to the soundtrack. Without giving too much away about the plot, if you enjoyed Kiss Kiss Bang Bang you’ll love this one (that actually has nothing to do with the plot). And we get the Shane Black trademark opening, a naked girl and a wrecked car (Lethal Weapon). The bad; the audience, it’s a mystery that our main characters are trying to solve, don’t think you’re smart by saying things out loud when they were clearly set up in the movie. No talking in the theatre! Overall, treat yourself and go see this film in the theatres. The Nice Guys is a nod to the bye-gone the buddy cop film, but with the infusion of a solid script and marvelous performances we’re given something extra special here. There are also numerous references to The Rockford Files (which I love), see how many you can pick up (gun in cookie jar, yellow pages ad…). The 70s police drama never looked so good. If you like Shane Black you’ll love The Nice Guys with every bumbling mis-step.